OSWEGO — The second annual Oswego Zombie Crawl will feature a walk, ghostly storytelling, charitable collections and fright night movies on Sept. 29. The family-friendly walk will begin at 6:30 p.m. that day at Oswego’s East Park. Zombies will make their way across the bridge along Route 104, ending at Greene’s Ale House, 104 W. Bridge St. 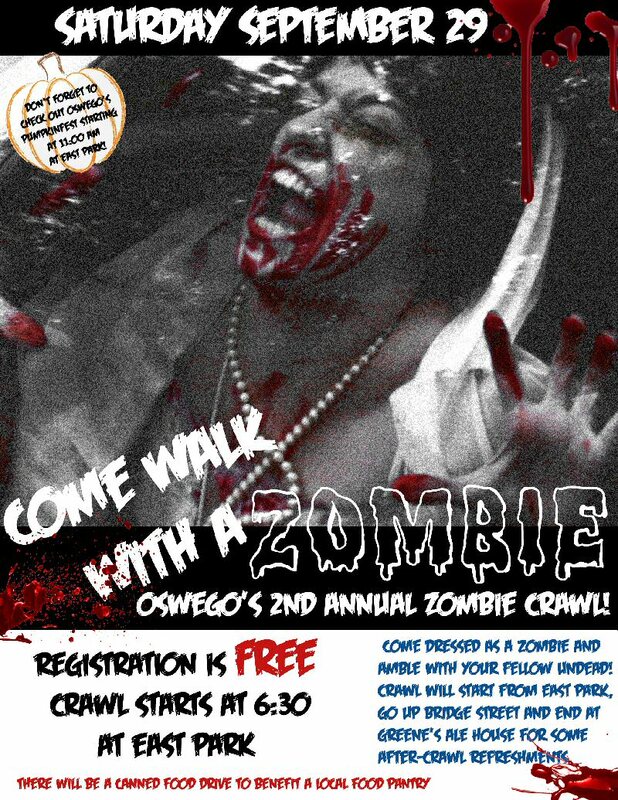 The second annual family-friendly Oswego Zombie Crawl will begin at 6:30 p.m. on Sept. 29, in Oswego’s East Park and amble westward to Greene’s Ale House, 104 W. Bridge St. The day’s events also will feature charitable collections, dramatic storytelling and monster movies. There is no admission charge to participate, although zombies are encouraged to bring a non-perishable food item, with donations to benefit Oswego’s Human Concerns Center food pantry. The event also will collect personal care and toiletry items as part of 12-year-old Oswego resident Emily Bradshaw’s drive to provide 300 personal care bags for the local homeless population. Organizers will set up a booth at Oswego’s CNY Great Pumpkin Festival, also happening Sept. 29 in East Park, to offer information or makeup tips for those aiming to get zombified. Waivers required for walk participants will be available as well. Some participating zombies will use what remains of their brains to judge the children’s coloring content. After the crawl, zombies are invited to stay at Greene’s to watch the zombie comedy “Shawn of the Dead” starring Simon Pegg. Food will be available to order, with the film slated to start a bit after 7 p.m. In addition, Oswego Cinema 7 on West Second Street will offer two showings of the new animated movie “Hotel Transylvania,” at 7:10 and 9:20 p.m., at which those dressed as zombies can receive a free small popcorn.